Here are some snazzy birthday facts about 13th of August 1908 that no one tells you about. Don’t wait a minute longer and jump in using the content links below. Average read time of 10 minutes. Enjoy! What day was my birthday Aug 13, 1908? August 13, 1908 was a Thursday and it was the 226th day of the year 1908. It was the 33rd Thursday of that year. The next time you can reuse your old 1908 calendar will be in 2020. Both calendars will be exactly the same! This is assuming you are not interested in the dates for Easter and other irregular holidays that are based on a lunisolar calendar. What day is August 13 this year? There are 109 days left before your next birthday. You will be 111 years old when that day comes. There have been 40,433 days from the day you were born up to today. If you’ve been sleeping 8 hours daily since birth, then you have slept a total of 13,478 days or 36.90 years. You spent 33% of your life sleeping. Since night and day always follow each other, there were precisely 1,369 full moons after you were born up to this day. How many of them did you see? The next full moon that you can see will be on May 18 at 21:13:00 GMT – Saturday. Fun stat: Your first one billion seconds (1,000,000,000) happened sometime on April 21, 1940. If a dog named Doodles - a Sloughi breed, was born on the same date as you then it will be 539 dog years old today. A dog’s first human year is equal to 15 dog years. Dogs age differently depending on breed and size. When you reach the age of 6 Doodles will be 45 dog years old. From that point forward a large-sized dog like Doodles will age 5-6 dog years for every human year. View the complete list of August 13 celebrity birthdays. Who are the famous August 13 birthdays? Here’s a short list of famous people in history who were born on Aug 13. View the complete list of August 13 famous birthdays. What happened on my birthday – Aug 13th? Octavian holds the first of three consecutive triumphs in Rome to celebrate the victory over the Dalmatian tribes. Maurice becomes Emperor of the Eastern Roman Empire. Buddhist monks from Kyoto, Japan’s Enryaku-ji temple set fire to 21 Nichiren temples throughout in what will be known as the Tenbun Hokke Disturbance. (Traditional Japanese date: July 27, 1536). The all black infantrymen of the U.S. Army’s 25th Infantry Regiment are accused of killing a white bartender and wounding a white police officer in Brownsville, Texas, despite exculpatory evidence; all are later dishonorably discharged. Women enlist in the United States Marine Corps for the first time. Opha May Johnson is the first woman to enlist. The Central African Republic declares independence from France. The Apollo 11 astronauts are released from a three-week quarantine to enjoy a ticker tape parade in New York City That evening, at a state dinner in Los Angeles, they are awarded the Presidential Medal of Freedom by U.S. President Richard Nixon. The roof of the uncompleted Rosemont Horizon in Rosemont, Illinois, collapses, killing five workers and injuring 16. One hundred fifty-six Congolese Tutsi refugees are massacred at the Gatumba refugee camp in Burundi. Three train cars derail and 11 people are injured after a landslide hits a mountain train in the Swiss Alps. View the complete list of August 13 historical events. What does my birthday August 13, 1908 mean? 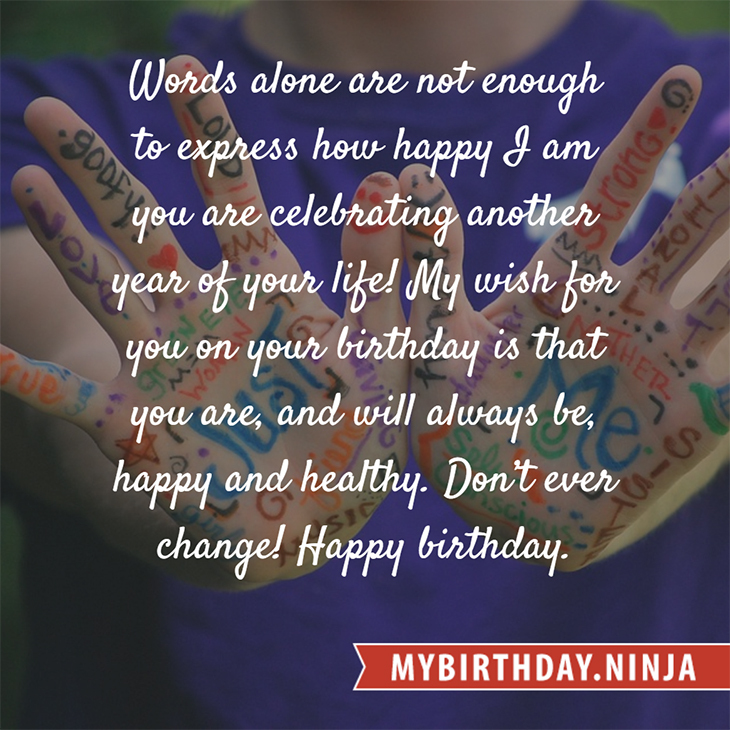 Your birthday numbers 8, 13, and 1908 reveal that your Life Path number is 3. It represents vision, imagination and joy of living. You possess a great talent for creativity and self expression. The following celebrities also have the same life path number: Stuart Murdoch, Hazal Kaya, Paul Vogt, Gil Hill, Renaldo Lapuz, Thure Lindhardt, Mari Wilson, Dos Caras, Roy Ward Baker, Lenny Kuhr. 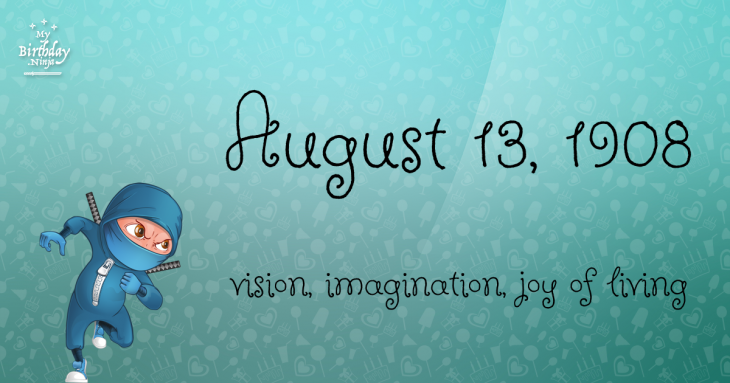 What is the birthday horoscope for Aug 13, 1908? The Western zodiac or sun sign of a person born on August 13 is Leo ♌ (The Lion) – a fixed sign with Fire as Western element. The ruling planet is Sun – the center of our universe. According to the ancient art of Chinese astrology (or Eastern zodiac), Monkey is the mythical animal and Earth is the Eastern element of a person born on August 13, 1908. What is the birthstone for August 13? Fun fact: The birth flower for 13th August 1908 is Poppy for preparedness. What is the Love Match for Aug 13, 1908? When it comes to love and relationship, you are most compatible with a person born on October 31, 1903. You have a Love Match compatibility score of +202. Imagine being in love with your soul mate. On the negative side, you are most incompatible with a person born on September 29, 1926. Your incompatibility score is -168. You’ll be like a cat and a dog on a love-hate relationship. Arf-arf, I want to bite you. Meow-meow, stay away from me! What is a good birthday trivia for August 13? What is the popular baby name on 13 Aug 1908? What’s your bizarre Florida Man story? The #FloridaManChallenge is breaking the Internet and social media. Some crazy men, women, or creatures from the Sunshine State are making headlines every day of the year including your birthday. Try this fun exercise. Pick your search engine of choice and type in “florida man August 13” and see what kind of wild news headline you will get. This viral craze started in 2013 and gets resurrected now and then. The latest was from Tumblr and found its way to Twitter. As they say, the rest is history. Here’s a quick list of all the fun birthday facts about August 13, 1908. Celebrities, famous birthdays, historical events, and past life were excluded. Try another birth date of someone you know or try the birthday of these celebrities: July 19, 1984 – Alessandra De Rossi, English-Filipino actress; January 28, 1936 – Alan Alda, American actor, director, and screenwriter; March 9, 1931 – Thore Skogman, Swedish actor and singer (d. 2007).